I'm honoured to have written the obituary of Neil Watson in today's Times. I'm grateful to his son Dan for his help at such a difficult time, and have thought a lot about Neil these past few weeks. He was an unsung hero of the UK surf scene and a good man. I'll be posting something very different in a day or so - something that I know would have made Neil smile - but meantime here are some words that are more personal than those in today's paper. Photos courtesy of Dan. The man who came to visit me looked more Hawaiian than any British surfer I’ve ever seen. Dark features, sculpted face, full head of hair, a strong frame and a powerful presence – Neil Watson was a man apart. We talked in my house in Porthcurno, west Cornwall. Neil knew this part of the world well. He’d honeymooned in Cornwall in 1969 with his wife Pauline, and returned year after year for 40 years. In Cornwall, he learnt to surf, way back when; he continued to surf in Cornwall on each trip he made but it was in East Anglia that Neil blazed a trail. Neil knew every break on the Norfolk and Suffolk coastline. He knew that this stretch of Britain gets good surf – on its day. Neil hardly ever missed an East Anglian surf day. Perhaps because he was there when surfing first took hold in Britain, and because he rode waves in an area that isn’t number one on surfers’ wish lists, Neil was deeply protective of UK surfing. He cherished it, nurtured it, believed in it. He encouraged the surfers in his neck of the woods and taught his son, Dan, to surf. They would later ride European waves but Neil’s surfing heart was as British as they come. That time in Porthcurno was our only meeting, but Neil and I kept in touch regularly, chatting on the phone, emailing, sometimes even – generationally challenged as we were – texting. I knew how hard Pauline’s loss hit him, and was struck by what a strong and wonderful marriage the couple had had. Neil spoke of his children, Dan and daughter Justine, and I knew how much he loved them both. But most of the time Neil and I discussed two things dear to the pair of us – writing and surfing. Neil was an unsung hero of British surf writing. He had good judgement, a respect for the facts, and an unostentatious style that told it as it was. His prose was clear and clean – like perfect barrel. He took a damn good photo, too. 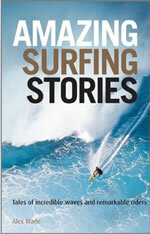 I was honoured when Neil said he’d like to see the chapters, as I wrote them, of Amazing Surfing Stories. His feedback was spot on, all the way through. If I lapsed into indulgence, Neil let me know. If I got it right, he was happy to say so. I knew that I could trust his every word. Now that Neil isn’t around I’m at a loss. Only a few weeks ago we were talking about an interesting but challenging surf writing project. I was looking forward to running chapters past him, as I wrote them, as I’d been lucky enough to do before. We’d become friends, talking about our personal lives, music, kids and, above all else, writing and surfing. Curiously, only now, thanks to a chat with Dan, do I realise that Neil and Dan were surfing the same Portuguese breaks as me back in August and September 1993. We’d all headed to the same part of the world for a surf trip. I like the thought that we might have been in the line-up together back then, without knowing it. Maybe it was ever thus; maybe this unknown interconnectedness sums up surfing. I count myself lucky to have known Neil, and, as will be the case for UK surfers everywhere, especially in East Anglia, I will miss him hugely. I was privileged to be able to dedicate Amazing Surfing Stories to Neil Watson, the Man in the East himself. Ten years ago I went to interview a bloke called Lord Neidpath. He is an aristocrat who owns Stanway House. His Lorship wanted to publicise the amazing single-jet fountain at the house. It's a big old thing that goes a long way up in the air. I did my research and discovered that Lord Neidpath (a) is one of UKIP's backers and (b) was once into trepanation (the drilling of holes in the head). Arriving at the ancestral seat, I was ushered down a long corridor into his Lordship's study. I was then asked: "Now then, what is it that you want to talk about?" This was a strange question given that the interview had been set up by a PR. I said that I was here to write a nice profile piece to publicise the rock 'n' roll new fountain. I also said that I'd done some background reading and was interested in his Lordship's experience of trepanation. Lord Neidpath then said: "Right, you have to go. We have to terminate the interview at once." "That's it, the interview is over. I had some chap from the Telegraph here the other day. Seemed nice enough, like you, but I made it clear that we weren't going to talk about that. Then he wrote about it." I promise not to write about trepanation, said I. We won't talk about it at all. "No, it's no good. Come on, out." I was miffed. I'd driven two hours to get to Stanway House and being summarily ejected after about three polite sentences was a waste of my time. I tried one more tactic. I'm a solicitor by trade, I said. I'll give you an undertaking as a solicitor that I will not write about trepanation at all. An undertaking is a serious thing! With that, his Lordship took me back down the long corridor, opened the door and chucked me out. As I went I said to him: "Well, this has been a complete waste of my time but I don't suppose you care about that." Lord Neidpath tutted dismissively and said you can't trust journalists. I was thinking about this incident earlier this morning when my thoughts turned to UKIP. I hate UKIP. They're such a bunch of tossers. LORD NEIDPATH, who once taught international relations to the former US President Bill Clinton, is happy to talk about Stanway House, his Gloucestershire ancestral seat, which is, for at least a couple of months, open to the public. But he’s not so happy to talk about his past, and specifically, trepanation, the 1960s fad of drilling holes in one’s head to induce feelings of wellbeing, in which the good lord indulged in his more carefree youth. A journalist for one of the Cotswolds county magazines, was shown the door when he dared to mention the dread subject. “I’m afraid we have to terminate the interview at once,” said Lord Neidpath. The intrepid hack promised that he would refrain from all such questioning, to no avail. “You can never trust a journalist,” said Neidpath, ushering the poor fellow from the house. Pictured courtesy of Wikipedia: a head. Never any time to write this blog anymore. Woe is me. Woe also was a bloke called Phil back in April. Somehow this bit of mindless surf rage passed me by when it happened. Yesterday I was chatting to Steve Bough, once of Wavelength and now of Wavelength again, and he mentioned it. "Google Bude surf rage and see what you think," said Steve. "It's outrageous." Trouble is, on one of my rare surfs the other day I heard of similar grief at a break up the coast a bit. I was at Sennen, and a local told me of a load of aggro perpetrated by not one but two people who'd say they were locals too, at their spot, on some poor hapless beginners who found this very public and accessible place, donned wetsuits and had the temerity to paddle out and try and catch a few waves. Guys, do you have to? I mean, do you want to be like the non-dude in this footage? Angry. Stupid. Intolerant. Mean-spirited. Selfish. Petty. Thinking you're big but just being small. That's my view anyway. Feel free to cast me from the water next time I'm there. As to when this will be, it will be a while. A summer of sea swimming has given me a painful ear infection. Also, and by way of returning to a perennial theme, I've yet again lost my confidence when surfing. My metal neck, my serially-broken ribs and my shoulder-devoid-of-cartilage just make me think that in a dynamic environment like the sea I'm going to get injured. The result is paddling for waves but not really wanting them. The result of this result is ending a session with no more than a couple of waves (usually quite nice ones), as if a part of me has beaten another part of me, against that part of me's better judgement. In other news, I had a day of hiking with writer Philip Marsden last Friday. Philip proved a fine guide to Rough Tor and other places on Bodmin Moor. No wonder, for he has a new book out, Rising Ground, which admirably examines what our collective (and individual) sense of place is, with the emphasis on Cornwall. This I'll be writing up for The Telegraph, who also ran this piece on SUP the other day (I am really not that fat, honest; I had to wear a lifejacket, rubber band, all that jazz). A run of Telegraph pieces continues with something on the Barnabas soon and this Saturday I will be researching yet another: chessboxing. Yes, chessboxing. Twelve rounds in which I will alternately box and play chess. The winner is the first person to knock out his (or her) opponent or win by checkmate. I've asked (a) that no one hits me on the head or in the face - the neck wouldn't take it; (b) that no one hits me on my right shoulder - it'd be agony, and (c) that no one hits me on my left lower ribs - they'd just break again. Maybe, when all is said and done, I should concentrate on the chess side of this assignment. Pictured courtesy of Christopher Pledger: this was actually my only fall. Except for the second fall when I tried to emulate Jason Bergin and do a flash turn. That much is true. I have recently moved house. Sort of. In the process one or two old photos have come to light. The pic above was taken by my mate Elliot Caldwell in 1984. We'd travelled to Newquay from Devon for the Boardmasters, which, if memory serves, was won that year by Martin Potter. We spent an enjoyable week camping somewhere (no idea where now), surfing every day, checking out the action and then, by night, either drinking a modest half of lager in Newquay or, in my case, skating the Holywell Skate Bowl. In fact we (or rather, I) drove my Mini into the bowl and almost tipped it over. Once it was back on the flat, the headlights proved useful in lighting up the bowl. The dismaying thing about this pic, from my ancient POV, is that it is incontrovertible evidence that once upon a time I was slim. Equally, though, it shows that I always was a bit of a fashion icon. The board, for those interested, was a Vision Gator. Apparently worth a few quid now but mine is long gone. Last Saturday dawned wet and grey. I awoke in the Hackney hinterland of Homerton, where Caroline has a place. I'd barely slept the night before, full of excitement and anticipation for the Championship Play-Off Final between London's finest football team and Derby County. I'm 48, so this could be seen as a little bit sad, but I prefer to see it as an endearing childlike enthusiasm for an abstract construct which stands for flair, creativity and football at its most beautiful, aka QPR FC. Whatever: the feeling reminded me of Friday nights in my early teens, when, living in Devon by then, I'd be looking forward to Dad driving up to Loftus Road for Rs' games. I couldn't sleep then either. Thanks Dad, for all that driving (all the more commendable because he didn't like football). Caroline and I left Homerton just after 9pm and drove across London to the K-West Hotel in Shepherd's Bush. This was a gamble on my behalf, as was my £1.00 flutter on QPR to win 6-2 at 150-1. I figured that if the Rs won, we'd want to be amongst it for the celebrations. Where better than Shepherd's Bush? Having checked in we started walking to Marylebone, where we were meeting one of my QPR mates, Jonathan Harris, at the Sea Shell Restaurant for lunch. Jonathan is a man of many hats and many connections. He put together a fine bunch of folk for lunch, including former Rs' midfielder Richard Langley. I once got a line from Langley after a QPR game that I was writing up for The Times; I can't remember what game but I do recall that Langley, a product of the QPR youth system who went on to play for Jamaica, was an elegant player who scored a hat-trick for the Rs away at Blackpool. Also there was French sports writer Phillipe Auclair, whose excellent Cantona I reviewed for the Times Literary Supplement. It was a pleasure to chat to a QPR hero (who is now a sports agent), and good to meet Phillipe again (who, it transpires, is also a successful musician under the name of Louis Philippe). My only regret over this very congenial lunch (thanks, Jonathan) is that I didn't get to talk to BBC journo Hugh Pym, who, it turns out, is another lifelong Hoop. The train to Wembley was a civilised affair, as was the atmosphere once we were at Wembley. I missed John Dawe and other Cornish Rs, likewise a number of QPR mates of old, but did bump into Mr Kinnersley of the Hoops and his brother outside the ground. And then, 90 or so minutes later, QPR were 1-0 winners. The first half was cagey and fairly even. Gary O'Neill was deservedly sent off early in the second half, we dug deep and defended a Derby onslaught, and Bobby Zamora - something of an enigma at Rangers - scored a fine, instinctive winner. Cue rapture. I couldn't believe what I'd just seen and nor could any of the 40,000 Rangers contingent. But it was true. We'd done it. We're back in the Premier League next season. Hats off to Harry Rednapp, for masterminding one of the great QPR defensive performances (admittedly not something we prefer at Loftus Road), and hats off to Zamora, a player not quite in the mould of the Queens Park Arrangers in Rob Steen's wonderful The Mavericks (Marsh, Bowles, Currie) but an Arranger nevertheless. Afterwards Caroline and I did an awful lot of drinking.